1902? 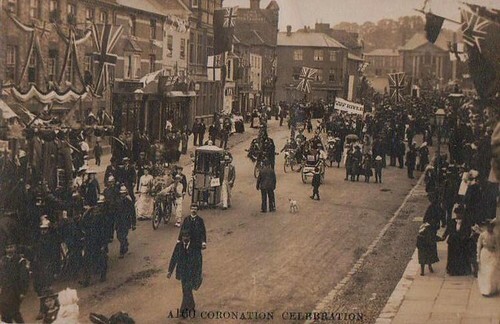 Coronation in Hart Street, Henley. A bustling Henley town centre looking towards the Henley Town Hall during what appears to be the height of Henley Regatta week. Horse and carts travel along a quiet (compared to Henley traffic nowadays) Hart Street with the familiar sight of Saint Mary's Church in the distance. The Catherine Wheel Hotel on the left with Saint Mary's Church in the distance. Hart Street in Henley taken from the town centre crossroads looking towards Saint Mary's Church.